Bathrooms are especially dangerous for children and older or disabled adults. Slipping is only one of the many dangers they face - so when you think about remodeling your bathroom, take into account a few tips to make your bathroom a safer place. Grab bars provide assistance when bathing or using a commode. They are made of durable heavy duty steel tubing and attractively finished with either a white powder coat or a textures diamond knurled gripping area. Professional installation is required. All of our anti-slip bathroom mats are made from durable, hard-wearing materials. We also offer PVC-free safety mats made from non-chlorinated natural rubber. Available in assorted colors with a non-skid back so the bath rug won't slip on wet floors. It's the perfect bath rug to keep your bathroom looking great and your whole family safe. This commode has three versatile functions: as a commode, raised toilet seat, and toilet frame. The seat height is adjustable and the commode comes equipped with a splash guard and a pail with handle and lid. Weight capacity: 300 lbs. Armrests drop down and out of the way to accommodate side transfers in restricted or confined areas. Drop arm mechanism helps with easy transfer. Adjustable position back. Quick assembly and requires no tools. Weight capacity: 300 lbs. 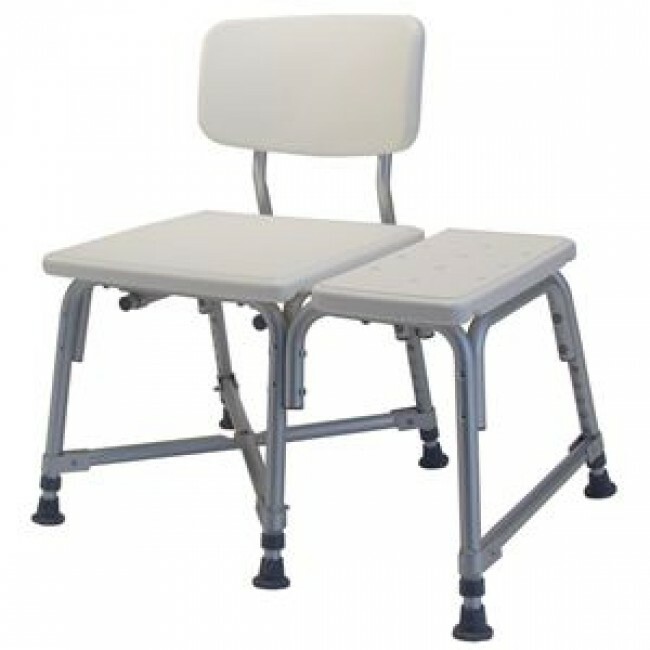 Heavy-duty welded construction offers more space between arms and higher seat adjustments than standard commodes. Weight capacity: 400 lbs. Height adjustment: 19.5" to 23.5" in 1" increments. Extra-long nylon reinforced hose allows user to bathe while sitting on a shower chair or bath bench. Designed for those that have difficulty sitting down or standing up from the toilet. Designed to work with your existing toilet seat. Available for round or elongated toilet bowl design. Weight capacity: 300 lbs. 5" heavy duty support brackets with vinyl caps to protect porcelain. Features a full splash guard that extends within the toilet basin. Adjustable height. Gentle downward slope toward front makes getting off and on easier. Lightweight, all plastic construction offers strength, durability and warmth. Weight capacity: 420 lbs. Standard 17.38" x 13.75" x 3.5". Fits standard toilets and elongated toilets. Toilet seat sits on top of raised toilet seat elevator. Weight Capacity: 300lbs. Convenient, one-piece, portable shower bench is great for travel. Rubber stops firmly hold the bath bench in place on tub without scratching the surface. Fits standard bathtubs measuring 19" to 28" wide. Available with or without back. Drainage holes in seat reduce slipping. Tool free assembly. Lightweight aluminum frame. Rubber tips on legs increase safety. Weight capacity: 350lbs. Durable blow-molded plastic seat. Aluminum frame is lightweight, durable and rust-resistant. Seat is adjustable in 1" increments. Weight capacity: 600lbs. Bath safely and comfortably with slip resistant tips and sturdy design. Large, height adjustable seat designed for use in a tub or shower and with hand-held shower spray accessory holder. Slip resistant rubber tips grip shower floor. Weight capacity: 400lbs. Safety handle for extra support and balance and can be attached to either side. Adjustable height aluminum frame, with latex-free rubber tips. Mobile Shower Chair is designed for safe transport to and from the shower; with a flexible nylon backrest. Features include anodized, non-corrosive 1" aluminum tubing and 5" swivel casters with rear-wheel safety locks. Once the pail is removed, chair easily rolls over most toilets. Toilet seat and pail are included. Provides support for the physically challenged and those who need just a little help standing and sitting. The powder-coated steel stand is sturdy and durable. Toilet safety rail offers foam-padded handles at the ideal height for proper support. Toilet safety rail has slip-resistant feet. Weight capacity: 250lbs. Two 9" high armrests ensure maximum stability. Attractive rustproof finish is easy to clean. Weight capacity: 250lbs. An economical transfer bench with adjustable seat height. Seat and back with textured slip resistant surface. Also available with commode seat and pail. Weight capacity: 300lbs. Provides assistance for those who have difficulty stepping over bathtub walls. Durable blow-molded plastic bench and backrest with extra deep seat for added stability. Frame is lightweight, durable and rust resistant. Weight capacity: 600lbs. Make transfers in and out of the bathtub safe and comfortable with this extra study, blow-molded bench that holds up to 350 lbs. Reversible backrest snaps in and out to accommodate right or left transfers. Textured, non-slip seat has drain holes and built-in slots for hand-held showers and soap. Weight capacity: 400lbs. Offers stability and comfort to the user. The bench has a vinyl padded seat that adds to the comfort. Weight capacity: 300lbs. The wide contact area of this bathtub rail helps disperse weight evenly up to 250 lbs. Ideal for use on fiberglass tubes, and it also attaches easily to tub with a mounting clamp. Fits tub widths for 2.5" to 5". Rail is 13.5" high. Weight Capacity: 275lbs. Innovative anti-reflux system and will not spill its contents, even if completely rolled over. Stain-resistant plastic also lets you see when emptying is needed with visible "full" line. Holds up to 32 oz. in a compact and lightweight design. Made of sturdy plastic, this portable urinal has a wide stable base that makes it easy to position for use. Available for Male or Female.